As usual, industry says its safe, government oversight is a façade, and the danger demands effective oversight, but with a corporatist state it is business as usual. What is happening in Canada applies to the US. Moreover, the US has the largest reserve of shale oil, see Wikipedia, bottom. That Scientific American raises a flag is very strong evidence, given their high review standards, that the issue is correctly stated—JK. FORT MCMURRAY—Air monitoring equipment litters northern Alberta. From Fort Chipewyan south towards Edmonton there are 17 sites measuring air quality, but here the monitoring outpost sits across the Athabasca River from the highway that connects the mining town with the oil mines to the north, and just down the road from the new multi-million dollar recreation center. Machines, such as the electronic nose or the laser-wielding robot that measures atmospheric ozone 10 kilometers up known as the sun photometer, constantly monitor the concentrations of pollution in the air. Data about acid rain-forming sulfur dioxide and nitrogen oxides levels feeds into a Web site updated every five minutes. Overseeing all this technology is Kelly Baragar, an air monitoring specialist for more than two decades who has worked in Middle Eastern deserts and Indonesian jungles before arriving here in the cold, boreal forest that is undergoing a rapid transformation into aworking landscape of oil extraction. "I have no issue bringing my family here, I'm just as happy here as anywhere," says Baragar, of the Wood Buffalo Environmental Association (WBEA), an outfit funded by the oil and gas industry to monitor air pollution from their operations in Alberta's tar sands. "I don't see any difference." That is a testimony to industry efforts to clean up air pollution—or, as Scott Wenger, manager of government relations for tar sands producer Suncor says of the steam and smaller amounts of other gases billowing from his company's smokestacks and joining the cloud layer: "We scrub it pretty good." It is also an illustration of the ubiquity of bad air, which has many causes, from forest fires to the off-gassing of tar sands mini-refineries like Suncor's, a record preserved in canisters of air and bags of lichen and moss that date back almost to Wood Buffalo's founding in 1997. The shy, self-effacing Baragar with his soul patch and salt-and-pepper hair, sees sulfur pollution from the northern U.S.—and even China—drift all the way to his remote air monitoring stations. But what goes up must eventually come down—and the pollutants put out by refinery smokestacks, the tailpipes of the world's largest trucks and other tar sands industrial equipment closer to home is accumulating in the water. The Athabasca River has carved bluffs in the Alberta landscape on its way north. But these natural bluffs are more than matched by the man-made sand dikes built to hold back many lakes-worth of tailings, the muck-laden water leftover after tar sands mining and treatment. Leaks of this muck, which contains a toxic stew of hydrocarbon residue, have always been a concern. "There is a risk if there was a leak into the river, it would be disastrous," notes chemical engineer Murray Gray, scientific director of the Center for Oil Sands Innovation at the University of Alberta. But "any release of tailings are disastrous for watersheds anywhere in the world." The difference may be the scale. Such waste lakes now cover 176 square kilometers, holding more than 830 million cubic meters of residue with another roughly 250 million liters of the muck produced every day. Wells are drilled all along the man-made bluffs to detect ongoing seepage and, if detected, to pump out the contaminated water. "A small amount will get past that," admits Randall Barrett, northern region director for Alberta's Environment and Sustainable Resource Development (ESRD) agency, although at a very slow rate, he adds. Given that the river also naturally erodes such tar sands deposits and carries away the bitumen, it remains difficult to determine whether the hydrocarbons in the river water came from natural floods or human mining efforts, despite abundant anecdotal reports of deformed fish and rare cancers in downstream communities such as Fort Chipewyan. After all, by one scientific estimate the Athabasca River deposits roughly an Exxon Valdez's worth of oil every four years or so along its more than 1,200-long kilometer journey. But that's only when scientists attempt to measure the pollution already in the river water. By measuring the toxic heavy metal pollution in snow, scientists have suggested that contamination exceeds background levels as much as 120-fold and can be detected as far as 85 kilometers from industrial sites. "It's hard to fingerprint because air pollution goes up, falls out as snow, snow melts, ends up in the river, is then detected—and it's hard to decide whether that's from oil sands or China," argues Andy Ridge, director of the water policy branch at ESRD. "The goal is to moderate the impact of development, but it will have an impact." But by taking sediment cores of naturally isolated small, shallow lakes north of here, a team of Canadian scientists, including government scientists from Environment Canada, have shown that hydrocarbon pollution increased from 1967, when the first tar sands mine opened, through 2010. The greatest contamination was found in those pothole lakes directly downwind of oil sands mining operations. In other words, the tar sands impact wasn't flowing down the river so much as falling from the skies into the river and other local waters. As biologist Peter Hodson of Queen's University in Ontario put it in a commentary on the paper announcing the findings published online January 7 in Proceedings of the National Academy of Sciences: "Assertions that [hydrocarbon pollution] in the [Athabasca River] watershed are entirely caused by natural erosion of bitumen are no longer tenable." The levels found in the sediment cores from five pothole lakes in some cases exceed Canadian standards for water quality to protect aquatic life and are at least twice as high as before oil sands development began. And sediments from oil sands have been shown to be toxic to some of the fish native to northern Alberta. At issue are so-called polycyclic aromatic hydrocarbons with names like anthracene and napthalene, among others, many of which are known to cause cancer and other health effects in animals and people. But instead of devastating these lakes, both algal productivity and tiny aquatic animals that graze on these blooms have thrived even as pollution has increased. This may be because warming temperatures have helped the algae grow more abundant and the increase in food has outweighed any negative impacts from oil sands pollution, the researchers suggest. "While current concentrations are not known to be toxic, by linking the rates of increase to rates of oil sands production, there is concern that projected increases in oil sands expansion will cause toxic contaminations to be present in lake sediments in 10 years or so," says biologist David Schindler of the University of Alberta, who was not involved in the study but also works on oil sands pollution. Further, the paper notes that even those lakes so close to tar sands operations have much lower levels of such toxic contamination than lakes in urban environments, which endure high levels of local coal, natural gas, gasoline and diesel burning. Even one of the largest industrial operations on the planet pales in comparison with themundane combustion of fossil fuels on a daily basis to power modern society. Baragar doesn't monitor for the kind of air pollution falling out of the sky and into these lakes at every site, and only reports "total hydrocarbons" rather than specific ones of interest. Wood Buffalo is most focused on the kinds of pollution that have legal limits, such as sulfur dioxide. The same problem can be found in the Regional Aquatics Monitoring Program, the water pollution monitoring effort set up by the oil and gas industry at the same time as WBEA. "We have been doing this for more than 40 years and we have yet to figure out a credible monitoring system," notes Jennifer Grant of the Pembina Institute, a Canada-based environmental group. For example, a project currently under consideration—Shell's Jackpine tar sands mine expansion—would have air pollution levels three times higher than Alberta's regulatory standards for nitrogen oxides, according to Shell's own analysis. Regardless of the air and water pollution getting out and about into northern Alberta and beyond, there remains the large problem of what to do with all those tailings lakes, which will take decades if not longer to settle enough to allow cleanup. New technologies may help speed up that process, such as using plastics or coal ash to help solidify the muck or even spinning it in centrifuges to wring out the water. But, even after such reclamation, pollution will remain a concern. It remains to be seen if rainfall falling on the reclaimed tailings pond known as Suncor Pond 1 will leach out buried contaminants or not. And then there's that highway here, which has gotten so busy that it is continually undergoing construction. Traffic in this town of roughly 60,000 people is as stop-and-go as cross-town traffic in Manhattan. Baragar's in-town monitor had to be moved away from the highway to get a better sense of ambient air quality without being overwhelmed by the emissions of all those idling cars and trucks. As it stands, air quality in oil sands communities is considered "low health risk," and lower health risk than larger cities such as Edmonton and Calgary. 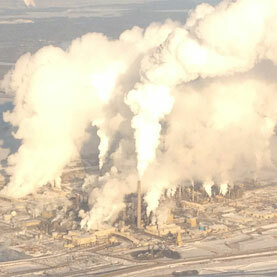 Whereas acid-rain causing emissions remain high and noxious odors are prevalent, the current air monitoring argues that oil sands development has not had an outsized impact on air quality. And there is no sign that contamination in water has reached levels that could directly harm humans living downstream, yet. That may change soon and the Royal Society of Canada, among others, argues that more monitoring is needed. "The landscape has gotten much busier," admits Bev Yee, assistant deputy minister at Alberta's ESRD. "Alberta is very popular with monitoring, everybody cares how Alberta monitors"—a tacit acknowledgement that the actions taken here have a local, national and even international impact. Global technically recoverable oil shale reserves have recently been estimated at about 2.8 to 3.3 trillion barrels (450×109 to 520×109 m3) of shale oil, with the largest reserves in the United States, which is thought to have 1.5–2.6 trillion barrels (240×109–410×109 m3).Worldwide production of shale oil was estimated at 11,600 barrels per day (1,840 m3/d) in 2002. The leading producers were Estonia (5,500 barrels per day (870 m3/d)), Brazil (3,100 barrels per day (490 m3/d)), and China (2,000 barrels per day (320 m3/d)). In 2008, China led production with 470 million liters (ML), followed by Estonia (445 ML) and Brazil (250 ML). The production of shale oil has been hindered because of technical difficulties and costs. In March 2011, the United States Bureau of Land Management called into question proposals in the U.S. for commercial operations, stating that "There are no economically viable ways yet known to extract and process oil shale for commercial purposes."